Cook the sandwich steaks in a 12-inch skillet over medium-high heat until cooked through. Remove the sandwich steaks from the skillet. Add the onion to the skillet and cook for 2 minutes or until tender. Return the sandwich steaks to the skillet and, using 2 forks, shred the steaks. Stir to mix the steaks and onion. Remove the steak mixture from the skillet and wipe the skillet clean. Butter one side of the bread slices. 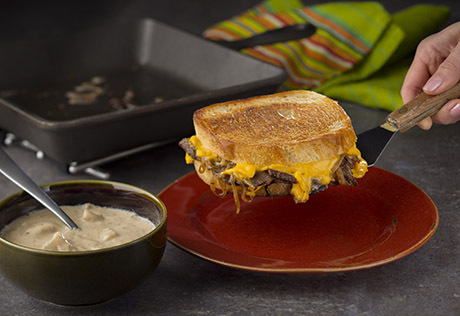 Layer the cheese and steak mixture between the bread slices (keeping the buttered sides on the outside). Heat the skillet over medium-low heat. Cook the sandwiches for 2 to 3 minutes or until golden brown and the cheese is melted, turning over once halfway through the cooking time.